* Product is good through stability expiration date. Product shelf life letter available upon request. This Five Panel Prescreen Plus Cup (CLIA Waived) delivers the most accurate and quick results for the initial prescreen testing. 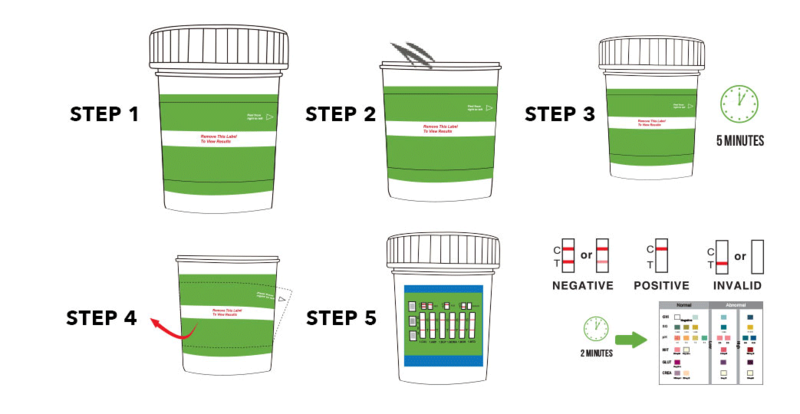 A urine test cup can detect up to 5 different illicit drugs in one testing. This prescreen urine test cup delivers some of the most accurate results. The test cups are CLIA Waived, which makes them a great choice for professional or personal use. Test results are available in 5 minutes, after collecting a urine sample. Failure to use the Drug Tests In Bulk PreScreen (CLIA Waived) Plus Test as directed may result in an inaccurate screening result. There were no product inserts associated with this item, please contact support for extra information.